I love the idea, but the one Achilles heel I could see, is that if there were failure to feeds or jams they would be a bee0tch to remedy quickly. They needs to make a backpack fed AR-15 upper and rig like this. Kind of like a non vapor-ware shrike for the modern man. 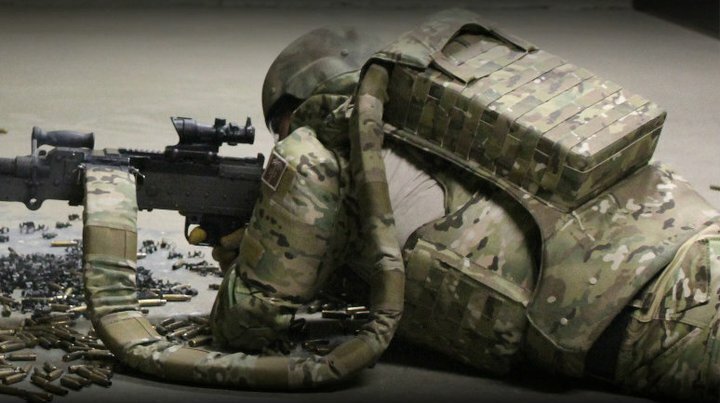 This combined with the Raytheon Exoskeleton I talked about in a previous post would allow the soldier to carry thousands of rounds of ammunition easily. Doesn’t the video say two 500-rounders? Yea you’re right, I changed it thanks. Maybe the “light” version is 500 and the heavy is 1000? Alternately: He is Heavy Veapons Soldier, and thees… is his weapon. I saw a contraption of the sort off a retro AR10 promotional video. I was just going to mentin that AR-10 vid. You beat me. I wonder how long it takes to get this thing back up and running when you finally do need to reload. I was just reading The Black Rifle and saw the same thing. hey, posted this on reddit! I’ll look into getting a reddit button soon if you think people would use it. That’s pretty funny. I thought maybe MICO was an acronym, but I can’t figure it out of it is. If you’re going to use the Raytheon Exoskeleton, then you may as well switch out the LMG for something more appropriate like a minigun slung from each arm, right? How is he going to clear a malf? Who’s carrying his other gear while he’s got that one? What if he takes a round to the back/pack ? How does it ride/feel? Center of gravity? You can tailor a ruck’s weight to allow for hum,ping can you do it with that? Are our 0331/etc’s running out of ammo and this is needed? Looks like a solution to a problem that doesn’t exist. Yeah, but it’s a really cool solution looking for a problem. 1) Malfunctions occur in between your hands, at the receiver. 2) Lightweight gear goes into buttpacks or satchel slings. 3) Exploding cartridges are not very dangerous outside of a firearm’s chamber. Mythbusters put one into an oven and it barely broke the glass. Standard eye protection negates the risk. As for the damage to the belt itself, presumably his AG would pop open his pack, break off the damaged section and relink the ends. Reading is fundamental. What occurs when the unit take a round (or more)? Does it cease operation? At no point did I talk about a cartridge discharge. D. I like the questions you ask. funny no one touched on the barrel change issue? also the last big fire fight in Afgan did not have a ammo problem – it had a re-supply/support problem! this concept dose look like a dead end in infantry support. Still doesn’t solve the problem of overheating. I notice that the short bursts are still applied in this demo – most likely to avoid munting that barrell. That being the case, I fail to see the benefit of traipsing all that ammo about for any weapon short of something that can produce continuous and sustained fire – like a vulcan. I’d like to see this combined with the chainsaw style machine gun grips that Knight’s Armament (IIRC) designed last year. This already was done in Vietnam by MACV/SOG with an M60. Refer to SOG paperback or chapter four of the book Photo history of SOG. It’s nice to know things are improving more or less. Anyone even remotely considered the weight of 1000 rounds of 7.62 x 51? I spent 26 years in the Marine Corps, and I sure as hell don’t want to hump this load (in addition to my normal gear) in a combat situation. I agree with the writer who says this is a solution in search of a problem. If the 1st SGT saw that he was wearing white socks his day would be over. They misspoke on the capacity. It holds 500 rounds of 7.62 NATO in the pack plus 75 in the feed chute. The 5.56 NATO version holds an even 1,000 total. If you go to the TYR website you’ll see an option to attach a pack on the back of the thing. Personally I’d use the MOLLE on it to attach a hydration rig and pouches for other gear. The point that the weight would be a lot is valid but its doable. Maybe not for the faint of heart. I do believe that there is a practical application for it to suppress enemy fire while your guys move about. Just gives em that much more time. Round counting might be a reasonable consideration. You wanna know when you’re getting low. An M249 saw that you can slap a mag in the side of would make me more comfortable about the idea of this rig having any kind of malfunction until its been vetted. I don’t think the M240 has that feature though. In regards to the barrel heat issue, I know from a MARSOC buddy of mine that they push those barrels way past what’s recommended. Firing should almost always be done in bursts and if you’re getting overrun and are forced to spray continuously then you do what you gotta do.